and her 1 great, great -granddaughter she is healthy. (A bit on the forgetful side, but healthy.) She enjoys her family so much and we enjoy her! As time marches on though, more often her thoughts drift back to her past. Her happy childhood and the years of growing up in Maine are now a common theme for her conversations. She reminisces often about the endless summer days spent at her grandparent's farm. When we have the chance, we all do our best to accommodate her this simple pleasure. 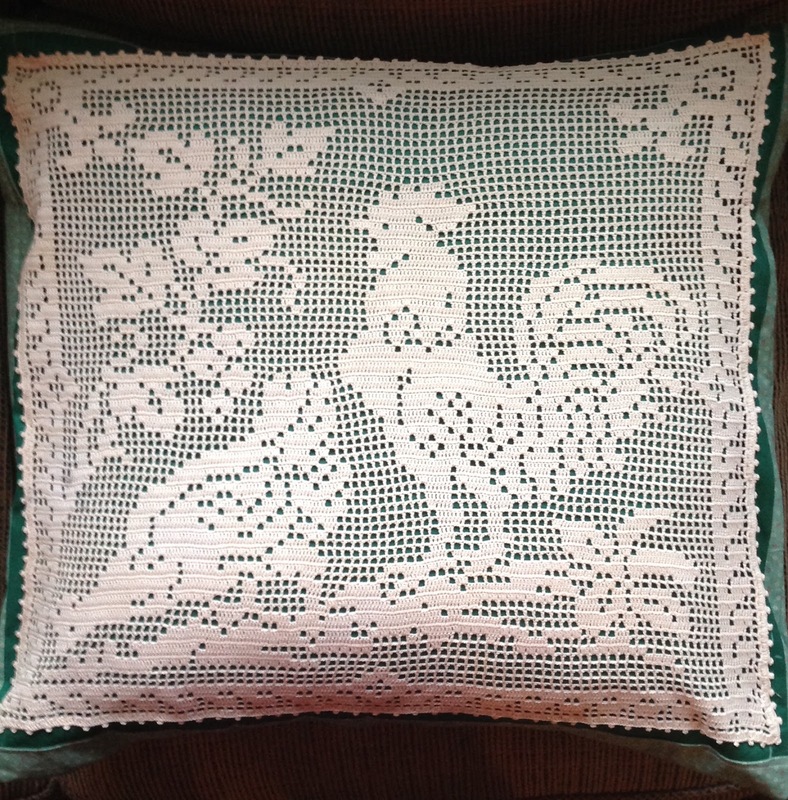 Many years ago when my grandmother passed away, my mother gave me a box filled with old needlework pieces crafted by my grandmother and my great grandmother. Dozens of doilies and filet crochet pieces were passed down to me. While some items have not stood the "test of time" others look brand new. 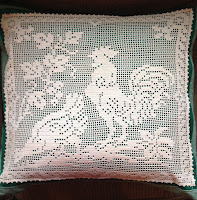 After a good soaking and gentle pressing I was able to make this pillow for my mom for her birthday. Words can't express how much she loves and appreciates it. It brings her back she says, to a simpler time. She keeps the pillow on her loveseat for all to see. It is a place of honor and it's presence has stimulated new found memories for her thus rendering interesting conversations. It certainly is the gift that keeps on giving. All of us have become recipients of the rich and treasured family history that my mom expounds. We listen carefully now, we know that these moments won't last forever.